My previous post on Lose 100 Pounds, Lose Friends has gotten a lot of traffic! I’m really happy with that post and the fact that so many people could relate to it. We are not alone! After work last night I met my beautiful friend Robyn for Happy Hour at The Bonfire Lounge. 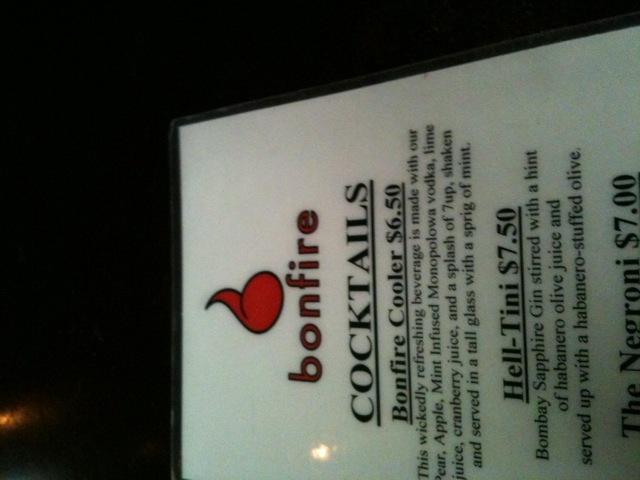 The Bonfire is a cool place. The food is surprisingly good — and not greasy bar food– for being a lounge. I used to go to the Bonfire for drinks before heading next door to dance at The Goodfoot. Fun times! Originally we had planned to meet at Washington Park to try trail running. Back in February I bought my first pair of Trail Running Shoes. I had planned on trying it out but the weather did not cooperate. Oregon has been a big, soggy, muddy mess this year. Then once it got closer to Hood to Coast I decided it was NOT wise to attempt trail running so close to a race. I had images of tripping and spraining my ankle or injuring myself in some way right before the race! Since I can’t run right now, we decided to eat and drink and talk instead! 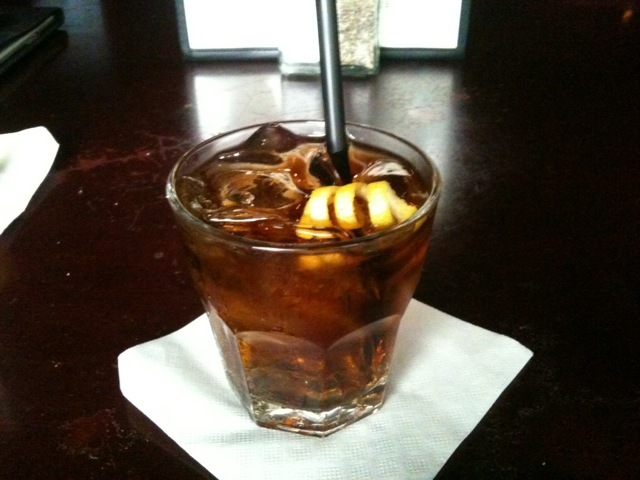 During Happy Hour I drank 2 Rum and Diet Cokes. That was my limit. About 65 calories each. But I over-estimate and call them 100 calories each. 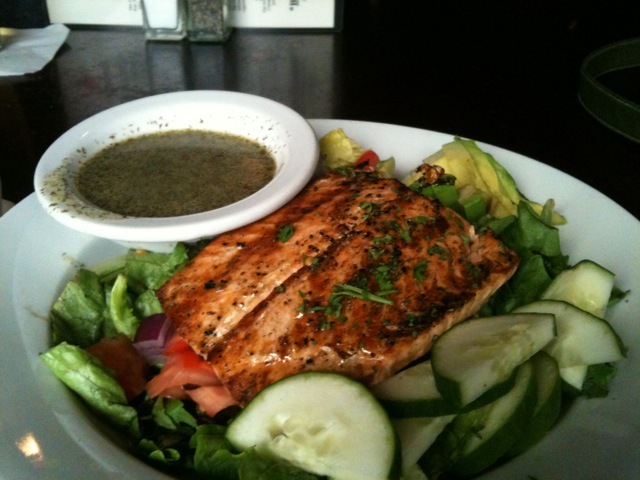 I ordered the Grilled Salmon and salad for dinner. Salad with sliced avocado, chopped red onion, tomato and cucumber. The dressing was a dill, lemon jalapeno vinaigrette. It was delicious! I was tempted to order the chips and guacamole or the taco or jerked pork burrito (YUM) but I was good. I just posted that I am going to focus on swimming and weight training while I heal. The most important component in all of this will be: FOOD. I really need to be good with my food until I am healed and able to fully workout again. Not running = metabolism changes. I want to avoid weight gain. Robyn has been one of my best friends for over 11 years now. We met online and became friends when I moved from Seattle to Portland. It’s been a wonderful friendship over the years. She’s been my friend through rough breakups, job changes, stressful times, happy times, weight gain and weight loss. A true friend. 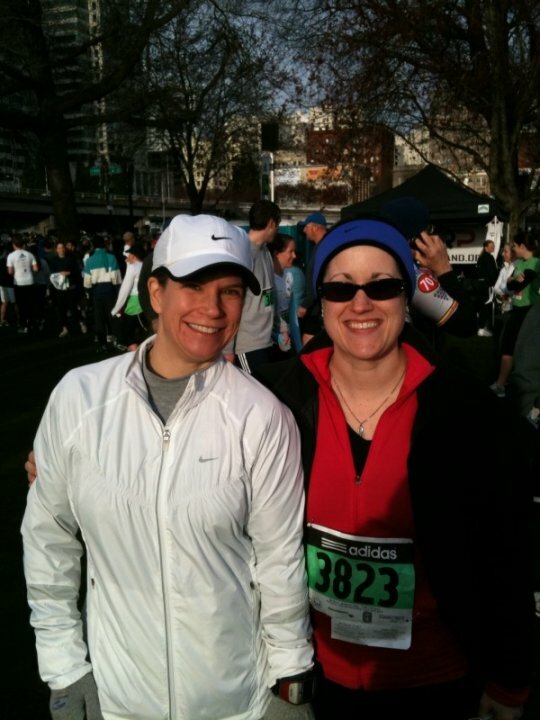 Robyn ran the Shamrock 8k with me back in March. Talking with Robyn last night about how hard I’m taking this injury really helped a lot. She’s “been there, done that” with the running injuries. She’s also struggled with her weight like me. She TOTALLY understand my completely irrational fear that I’m going to gain back all my weight. Having someone who understands you (even when you’re being irrational and neurotic) is a great feeling. It may be a simple solution to a lot of people: Injured? Stop working out. But for someone that lost a significant amount of weight through exercise, it’s a more challenging thing to do. Robyn bought me dinner last night to congratulate me for completely Hood to Coast. It was a really sweet thing to do and it was nice to celebrate! I went home feeling much better and even more determined to get through this in a positive way. When I got home, I explained to Michael (in a much better way) how I was feeling and he comforted me. xoxox I’m trying to feel better! I shared Rachel’s Weight Watchers story on my blog. She’s lost even more weight! She’s doing a great job! Thank you to good friends! QUESTION: Tell me about your best friends! As a friend, I think I’m like Rachel. I don’t sugar coat things and if someone only wants a softball version and they aren’t ready to hear the truth then they’d better warn me. Otherwise, don’t ask. I have a variety of friends these days but I have to say that my husband is my best friend. He’s just the person who thinks the same way I do and always has the exact same reaction to things that I do. Not like when you tell a story and one person says “How great!” while the other says “How awful!” He totally gets how I’m going to react to any given situation and generally feels the same way. I do think girlfriends are important too, and I have a few good ones here. My oldest ones have gotten busy and drifted off for the most part. But loyalty is worth a lot more to me! Agreed -Opinions are often unpopular.